Being a bit of a blush fiend, one of the first items I always look out for in a new collection is the blush. If the blush catches my eye, I will pay a little more attention to the collection. If it doesn’t, I tend to overlook it. Which is why I felt that Dior’s Spring 2012 blush jarred a little with the rest of the collection. 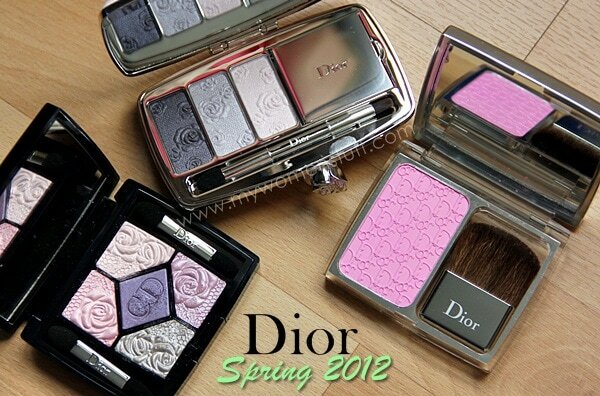 The Dior Spring 2012 collection is called Garden Party and the star product as well as the eye shadow palettes bear imprints of flowers. I rather expected that the blush would be the same. However, it is embossed instead with the Dior logo. That reminds me of Dior monogram canvas bags. I thought it a little unusual because Dior is usually quite meticulous in their themes. The Lace Dentelle collection had a consistent theme of lace throughout. But that is otherwise, the only fly in the very beautiful ointment because I urge you to head down the Dior counter and get your hands on the Rosy Glow Healthy Glow Awakening Blush before its all gone. I’m told its already flying off the shelves as we speak! The colour is 001 Petal/Petale, but it is just 1 shade. In the pan and swatched on hand, it looks a light matte cool pink. However, I will urge you to give it a try on your cheeks because this Dior Rosy Glow blush is supposed to adapt itself to your skintone, to give you a perfect healthy glow every time. I must also confess to a little bit of disappointment when I opened the cover of the blush, because as you can see, the product is only one half of the case. It is packaged like the powder foundation as opposed to the regular Diorblushes. It is even different from the Lace Dentelle blush that was HUGE! The colour in the pan is a bit of a shocker. You get a flat matte looking vibrant pink. It is one of those colours you’d look at and think “How on earth do I wear this? !” But there isn’t much to worry about because it actually applies on the skin a lot lighter than you might expect. Good and bad, I guess, depending on your preferences. 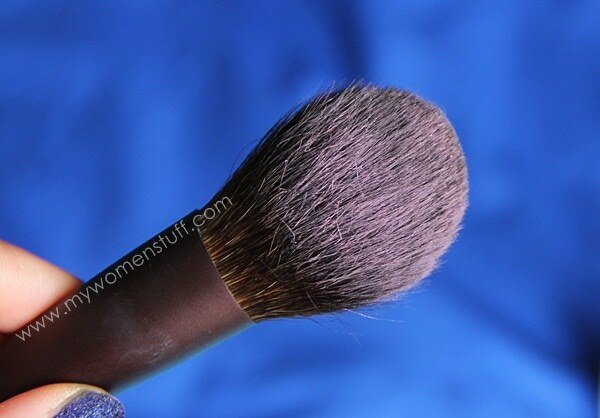 The texture of the blush is soft and very smooth. I suggest that you only dab on the surface once with your blush brush because you may end up picking up too much. I use a natural hair brush and 1 dab or a gentle swipe is more than sufficient. If you use a synthetic bristle brush, you may find it does not pick as up as much colour with just 1 swipe. You could just as easily use the brush included. It is fairly good in a pinch, but may pick up more colour than you intend so use a light hand. As you can see, on the brush, it isn’t as scary pink as it looks in the pan. It is in fact, a very gentle sort of colour on the skin as as promised, it will adapt itself to your skintone. On my skin, I find it takes on a slightly rosy tone, which is very nice and as promised, looks very healthy. I used this in my review of the Garden Roses eyeshadow palette so I’ll just repeat the photo here. 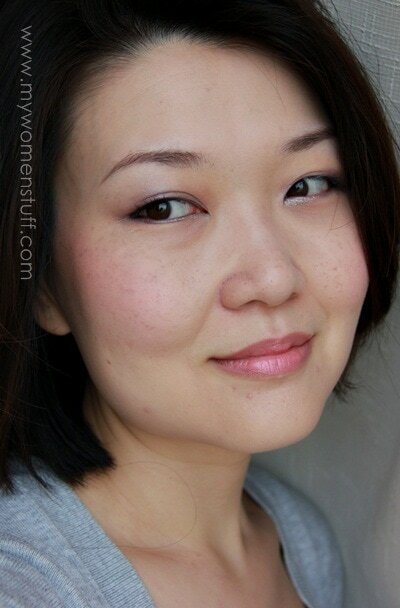 A matte bright pink blush in the pan that applies on the skin lighter than it looks. The colour is supposed to adjust itself to your skintone to give a healthy glow and this is exactly what it does. I find that very little is enough for a more natural colour as it may deepen slightly throughout the day. I use just 1 swipe and that is enough. 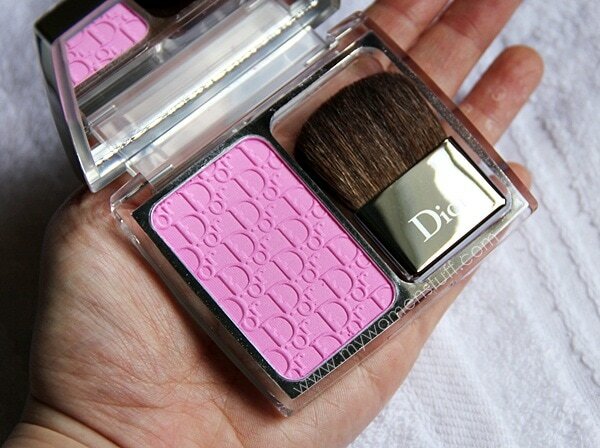 I wish it wasn’t limited edition because this is a worthy addition to the permanent Dior blush range! Pros: Fine sheer powder, Pretty colour that adapts itself slightly to your skin to give you a perfect healthy glow, The brush included is serviceable but one needs a light hand with it. 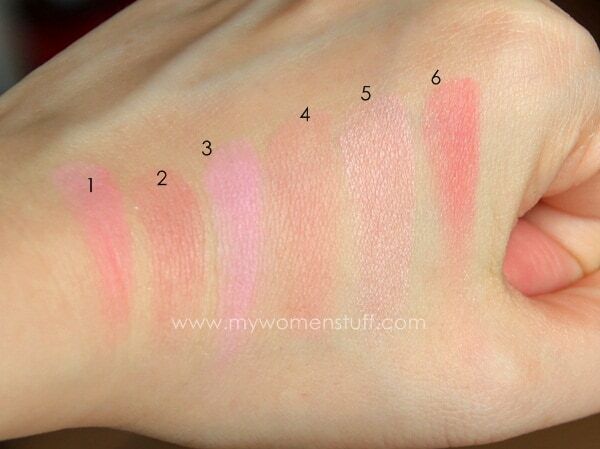 I have here a comparison of the Rosy Glow Petal blush with a few others I own. I thought it might be similar to Nars Angelika or Desire but I don’t have those 2 colours anymore so it may or may not be similar. I also realized that this is the only straight pink blush I have in my collection. Every other blush I own either has peachy or rosy tones! Disclosure: Featured product was provided by PR for consideration. For posting guidelines please see my disclaimer. NEXT POST: Embrace change : Get a haircut and potentially look years younger! This is one of the products I’ve shortlisted to need (want!) to buy. 🙂 I’m glad it got such raving reviews from you. Someone once asked me to pick ONE brand to stick with for the rest of my life for makeup. I blurted out Dior in a flash because they have always been consistent in their quality. Their eyeshadows are topnotch, like most of their lip colours. And this blush looks amazing! Frankly, I’m glad they did the Dior canvas embossment. Gotten a little tired of the cannage. It’s a fresh twist. PS-Mila Kunis is another new face to Miss Dior! I do like how pink it is, but I wonder how it would transform on my cheeks? Ahhh! OMG @_@ This is sooo pretty~~~ But RM150..hmm…..I gonna think if I really need it. Gorgeous pic, PB! All the colours look great on you. Its bright yet not too bright 🙂 A very pretty pink shade – I haven’t seen many brands with this colour locally. The only one I thought of was Nars. I did think so too 0 imagine pretty flowers all over it! 🙂 But the use of the monogram makes me think that maybe, just maybe, this range will be made permanent at some point because I think it should be! I love that photo of you. The color palette in this collection works so well with your complexion! Sadly its quite true that good stuff tend to be pricey 🙂 Good luck with this! Thanks for the review, Ms Blush Expert 😛 May I know if this is going to emphasize pores around the cheeks? I am looking for matte blush because I reckon I have enough facial oil to make myself glow with a bit of blush, no need for glitter bomb blushes. I love how it looks on you 🙂 so pretty! Thank you Jan and replying your comment on FB, skin tone isn’t an issue! Just layer it on for more colour although I do think even darker skin tones could just use this with a light hand for a pretty flush from within. That is very VERY pretty! You evil evil evil Paris! Hi Paris. How many grams of product is there in this blush? ahh… one more thing. Not related, but how is your Burberry lippy doing? The one with the strange smell. Is it usable? Really beautiful! The cool pink suits you! Thank you Jamilla, it does! But it also turned out a little warmer than I expected. Your blush shades are so different from mine! haha, my are all on the warm/coral side. this blush looks so pretty on you. I would have never guessed that the colour on your cheeks and on the pan were one and the same. I had originally passed up on this when but after seeing it on you, I might just ask mum to pick one up for me! This blusher looks lovely on you! Such a pretty pink glow. I can’t believe how pink it is though, Pink Explosion looks positively peach next to it! Oh I just realized! Dior did something similar to this with the Dior Addict Lip Glow. It has the same concept, although I’ve never heard of a powder product that changes depending on the person wearing it. I agree completely that this blusher included with the rest of the collection is really jarring. I had really hoped for more pretty highlighters and highlighters with flower embossing, like in the Dentelle collection. It would have made a more solid collection. I think this one looks good, but the aesthetic just doesn’t fit. 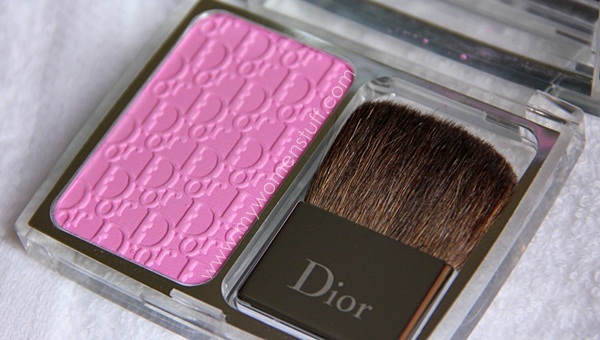 There was a limited edition eye shadow duo with the Dior embossing , that would have looked great released in a collection with this blusher. They should have released this in a collection repromoting the Lip Glow to make the most of the colour-changing conept, don’t you think? Now I think about it, the packaging would like right at home next to Lip Glow!